on this page we would like to bring you stories or recommendations of our colleagues about the impact of appointment at the Institute on their professional carrier. We hope their words will be inspiring for our future colleagues. prediction and characterization of novel functional compounds. I am now continuing the fantastic journey into what fascinates me the most – crystal networks, polymorphism and structural phase transitions – at the Advanced Technologies Research Institute in Trnava, where I focus on predicting new materials for future electronics and spintronics. Q1: Are there any connections between the activities at IIC SAS and your recent position? I am still employee of IIC SAS, however during my PhD. 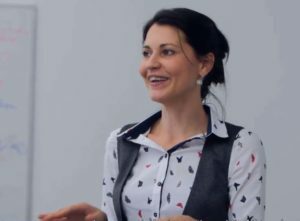 study I spend half a year at Empa Swiss Federal Laboratories for Material Science and Technology and as a PostDoc I had the possibility to spend one year in Germany at the University of Applied Science in Muenster and half a year in Switzerland at Empa. Good collaboration later on resulted in another 2 years project with Switzerland on which I participated. Q2: Please comment your relation to your stay at IIC SAS? I greatly appreciate the opportunity to work with colleagues at IIC SAS. During my stay, they gave me many valuable comments and suggestion that helped to improve my knowledge and laboratory skills. PhD. study at the IIC SAS gave me a broad background in the field of preparation and testing of ceramic. The IIC SAS is very well equipped with new machines which was very useful also during my stay in abroad. At my recent position I am just the second month. Nevertheless, there was, is and will be a strong collaboration between my current institute and the IIC SAS. Myself I am still in contact with many of my previous co-workers. Not only professional but also personal. I keep in mind that the IIC SAS are well equipped, and on demand they can offer a help with measurements, experiments and advice in professional manner. It was during my stay at Empa and I am pretty sure that it will be in the future too. At IIC SAS I stayed during my PhD. study, except 1.5 Year, which I was at the University of Muenster in Germany. I have to say that every employee was helpful and participated on my career and development. The gained knowledge I utilized mostly at Empa, Switzerland, where the first 2 Years I was as a postdoc and stayed there for another 2 years as a researcher. What means that the acquired professional skills at IIC SAS are really helpful. Q3: Can you give some recommendations to the management of IIC SAS? The management of IIC SAS should improve the advertisement of the academy. The opportunity of studying diverse materials and be by the breakthrough discoveries should be the main advantage for the young people to go there. Moreover, the chance of get in touch with many different cultures, peoples and visit interesting places is a great benefit too. The applicants should know these. Actual position: Research scientist at NASA Godard space flight center, Greenbelt, Maryland and a Visiting Assistant Research Scientist at Univesity of Maryland College Park. I am a team member on the Sample Analysis at Mars (SAM) Instrument Suite, one of the instruments on Curiosity rover. 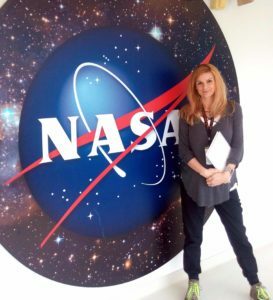 I am a chemist/clay mineralogist with a research focus on the mineralogy and chemistry of martian samples and their analogs and in general I specialize in synthesis/analysis of terrestrial Mars analog materials that are directly relevant to interpreting MSL (Mars Science Laboratory, more known as Curiosity) flight data. Recently, I am investigating the possibility of reduced nitrogen reservoirs on Mars. The potential detection of reduced N compounds on Mars has important implications for the development of a nitrogen cycle on Mars, and therefore Mars’ potential habitability. My focus is on preparation of clay minerals with NH4+ cations in the interlayer space which are characterized with a variety of analytical techniques, such X-ray diffraction analysis (XRD), Evolved Gas Analysis (EGA), FTIR (Fourier Transform Infrared) ATR, Elemental Analysis (EA), Gas Chromatography Mass Spectrometry (GCMS) etc., which are later compared to the real flight data. At this point is very important to mention that all my detailed knowledge I gained about clay minerals and their characterization by various methods was during my PhD. study at IIC SAS. My PhD. 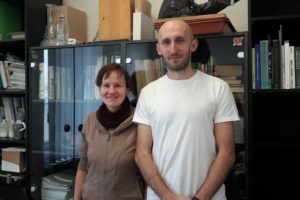 supervisor Dr. Peter Komadel and Dr. Jana Madejová are recognized capacities in the field of clay minerals and Slovak clay group has a very strong reputation worldwide, thus I got really solid background, which I am using up to this day. The connections between activities at IIC and my recent position are very active. The Department of Theoretical Chemistry and the Department of Hydrosilicates are focused on the research of organoclay materials, which is also one of the topics of my research activities. I actively collaborate with both IIC departments. I appreciate much the beginning years of my scientific carrier including the PhD study that I spent in the Spectroscopy Laboratory later renamed on the Department of Theoretical Chemistry. I found there a very friendly environment where I could growth professionally and also personally. The collaborations with colleagues from IIC are focused on modeling of various materials including organoclays and during the long-standing collaboration we published about 20 joint publications. Maybe the management of the Institute should focus more intensively on seeking young talented students at universities because I have a feeling that it is more and more difficult to hire really good students for PhD positions. This also could include seeking students from abroad (generally).